Starved Rock State Park is a state park in Illinois, characterized by the many canyons within its 2,630 acres (1,064 ha). 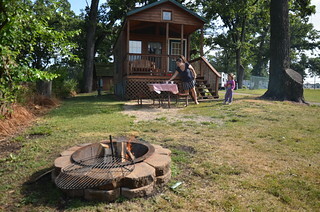 Located just southwest of the village of North Utica, in Deer Park Township, LaSalle County, Illinois, along the south bank of the Illinois River, the park hosts over two million visitors annually. In the pre-Columbian era, the area was home to Native Americans, particularly the Kaskaskia who lived in the Grand Village of the Illinois across the river. Louis Jolliet and Jacques Marquette were the first Europeans recorded as exploring the region, and by 1683, the French had established Fort St. Louis on a large sandstone butte overlooking the river. According to a native legend, a group of Illinois Confederation (Illini) pursued by the Ottawa and Potawatomi fled to the butte in the late 18th century. The Ottawa and Potawatomi besieged the butte until all of the Illini had starved, and the butte became known as Starved Rock. The butte area was designated a U.S. National Historic Landmark in 1960.